The V3s targets the Car Digital Video Record (DVR) and IP Camera (IPC) Monitor System market. 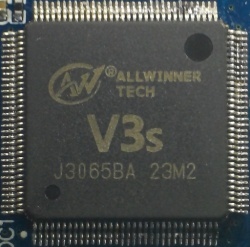 It comes in a hacker-friendly 128-pin eLQFP package. This page was last modified on 11 May 2018, at 10:01.